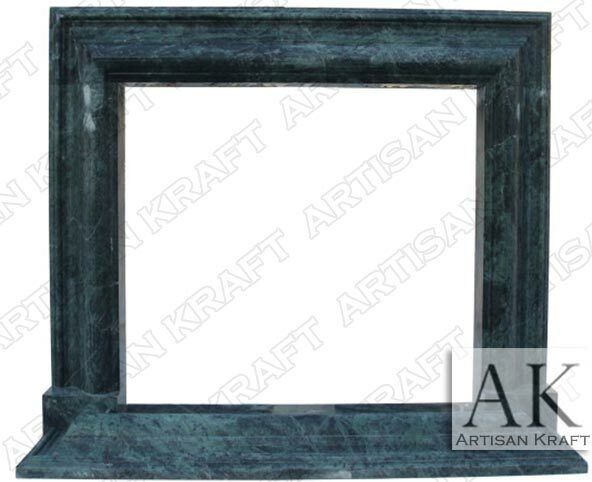 English Bolection Surround pictured in a rich green marble that works well in a formal or relaxed environment. Can be custom ordered in a variety of stone choices. Here it is pictured in green marble. It was made for a classic library but it can just as easily be found in a modern space. The Bolection Surround Fireplace is a very versatile design in that way. It perfectly blends modern and traditional styles making it a perfect fit for either. It is a hybrid of contemporary and traditional. This mantel can just as easily be found in a hundred year old French Chateau as well as a modern home built in Los Angeles. We have several of these models set up in our Chicago Fireplace Showroom.